When it comes to hygiene and preventing the spread of infection, especially at busy public events, hand washing makes a significant difference. Washing thoroughly with soap and water helps remove a variety of common bacteria that can spread infection. This is especially important when animals are present either with patrons, when food is being served and consumed, or when guests, or patrons include children and the elderly, or infirm. Luckily, there’s a safe, economical and convenient solution. The Rent A Loo plastic free standing hand wash station has a two sided stand with basins & soap and can be located almost anywhere . They are foot pump operated. The fresh water capacity is 83 litres, with a 91 litre waste capacity. Something that is often lacking at an event or function is somewhere to simply wash your hands or get clean. How often have you been out somewhere having fun at a festival, fete, or outdoor show- hunger has set in and you go to get something to eat, only to realise that your hands are dirty and there is nowhere to wash them? If you are clever and have some wet wipes or even a bottle of hand sanitiser with you, you are lucky but, in any event they still don’t do the job as well as a good wash with soap and water! You also need somewhere to wash your hands after you’ve eaten, especially if you have had take away food and have greasy fingers or have managed to get sauce on yourself. Washing your hands after eating keeps your clothes clean and means you can still use your phone! That’s where Rent A Loo, come to the rescue… Our easy to install, free standing, back-to-back portable hand wash stations are the perfect solution and you can hire them on their own or with any combination of the other amenities we have in stock. They are also a great addition to our portable toilet hire. 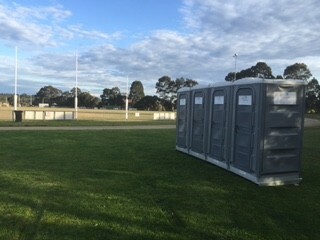 If you are running a big event, and want to keep the toilets free for their main purpose, adding a bank of portable hand wash stations or sinks is a great way to achieve just this. When are portable sanitation stations a good idea? Relatively inexpensive – ask us for a quote. You’ll be pleasantly surprised. No need for mains water or waste water connection – fully self contained.